Pankhida Garba with Preity Zinta & others - IndoreRocks!!! One of the more famous and rocking Garba festivities in Indore, Pankhida Mahotsav has been around for nearly two decades !! 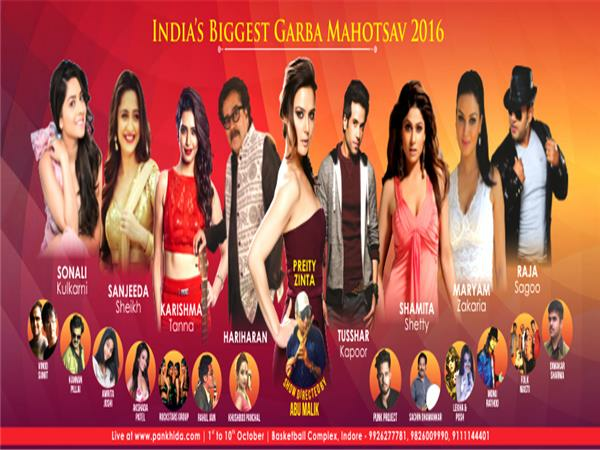 Pankhida has been known to get celebrities / famous names to the garba dances in Indore, and this year, the star cast is led by none other than famous Hindi Film (Bollywood) actress !! "I want to join your team"
I hv good knowledge about singing with diffrent lanuages ..i want to join ur group for help cancer patients child and to boostup my talent with the best team like you. can i come in this garba night.2018.